A gigantic cavity -- two-thirds the area of Manhattan and almost 1,000 feet (300 meters) tall -- growing at the bottom of Thwaites Glacier in West Antarctica is one of several disturbing discoveries reported in a new NASA-led study of the disintegrating glacier. Another changing feature is a glacier's grounding line -- the place near the edge of the continent where it lifts off its bed and starts to float on seawater. 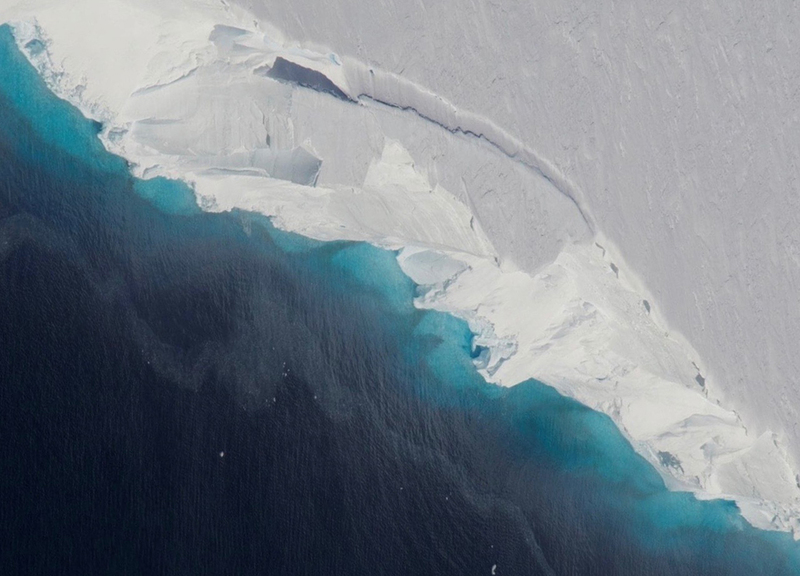 Many Antarctic glaciers extend for miles beyond their grounding lines, floating out over the open ocean. The huge cavity is under the main trunk of the glacier on its western side -- the side farther from the West Antarctic Peninsula. In this region, as the tide rises and falls, the grounding line retreats and advances across a zone of about 2 to 3 miles (3 to 5 kilometers). The glacier has been coming unstuck from a ridge in the bedrock at a steady rate of about 0.4 to 0.5 miles (0.6 to 0.8 kilometers) a year since 1992. Despite this stable rate of grounding-line retreat, the melt rate on this side of the glacier is extremely high.